Bakersfield will be in the mid-90s with bad air quality on Thursday. BAKERSFIELD, Calif. — We're sunny and stable today as high pressure continues to build. That brings us the warmest temperatures of the year so far, with valley air quality that is unhealthy for sensitive groups again today. The south valley soars to highs in the low to mid-90s with a high of 95 this afternoon in Bakersfield. The mountains are feeling the heat too with highs in the mid to upper 80s in the Kern River Valley and the low 80s in Tehachapi with upper 70s in Frazier Park this afternoon. 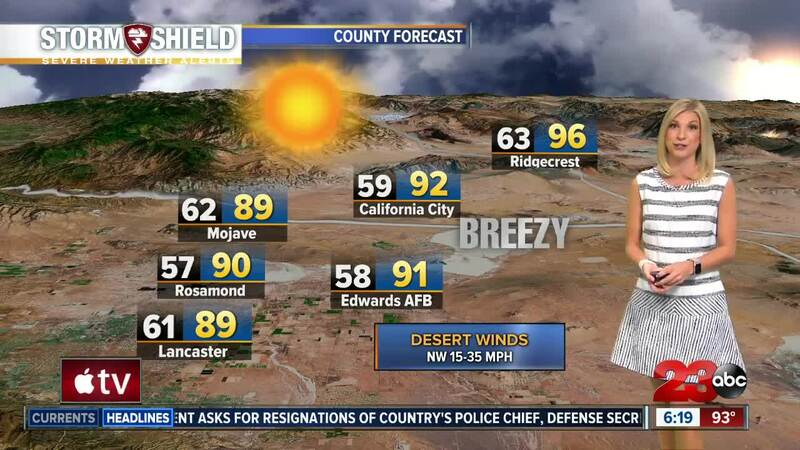 The desert won't get a break either, with afternoon temperatures topping out in the 90s for everyone, including a forecast high of 97 in Ridgecrest today! We'll start seeing temperatures slowly fall to the low 90s tomorrow and Saturday with increasing clouds as the ridge of high pressure responsible for all this heat starts to move east. That makes way for a westerly wind and some clouds to start moving in from the ocean once again this weekend. We'll see a fall to the upper 80s by Sunday with a storm tracking onshore Monday that could trigger thunderstorms, especially in the mountains. The National Weather Service also wants to remind everyone that "Along with this rapid increase in temperatures will be an increase in snow melt in the mountains. An increase in snow melt can make rivers levels rise with swift currents, and the water within rivers will be very cold. The combination of a swift current with very cold water can result in dangerous to deadly conditions for those planning to enter area rivers to get relief from the heat." Send us your storm reports, weather photos and videos!